I have been trying to download some pics to a post and not having any luck. I have tried clicking on the attachment icon and nothing happens. I was expecting the "browse" window to open but nothing happens. Same with the "insert image" function. I tried copy/paste also with no luck. I'm pretty sure that I have had success before. ... make sure that your web browser allows 'pop up windows' to occur from this site. If that doesn't we'll continue to troubleshoot this. I attached this picture by going to the "Quick Reply" area at the bottom of the page and typing this message. I then opened Windows Explorer and navigated to the picture, clicked on it and dragged it to the box marked "Drag Files Here to Attach". When the upload was complete I clicked "Post Quick Reply" at the bottom. I have had problems with the attach icon before, but this method always works, so it is what I always do now. Problem solved! I realized that on this site my computer displays a streamer on the bottom of the screen saying "only secure content is displayed" with an option to click on "show all content". When I click on that option it allows me to down load pics and post them. 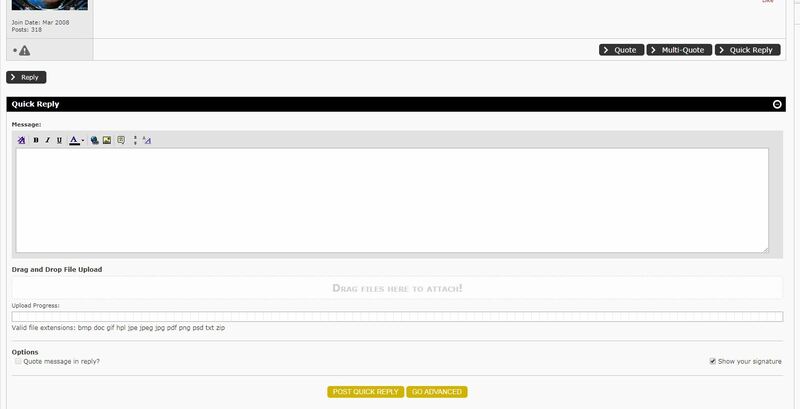 It is probably a setting in my Norton security settings but it is funny that this forum is the only one affected by it. While we are talking about weird stuff, I also can't use the "Quick Reply" option to post, I have to go to the Go Advanced page to do that. Last edited by SolsticeHank; 11-27-2018 at 08:25 AM. Glad you got the image issue figured out. The quick reply issue sounds like a corrupt cookie. Try giving your cookies and cache for the site a clear.